Wagner's 'Ring' Reimagined in America A bold new interpretation of Richard Wagner's Ring cycle sets its timeless tale of the corruption of power in a more contemporary American setting. Director Francesca Zambello talks about what's being called the American Ring. 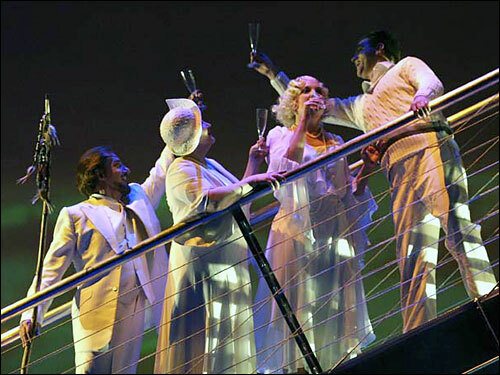 In this scene from the Washington National Opera's Das Rheingold, the gods are clad in 1920s-era outfits, evoking America's pre-Depression period of affluence and optimism. Picture the Rhine as an American river and the Niebelungs (dwellers of the underworld) as members of America's underclass. A bold new interpretation of Richard Wagner's Ring cycle, setting its timeless tale of the corruption of power in a more contemporary American setting, is premiering at the Washington National Opera. 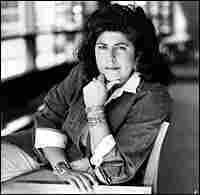 At the helm is Francesca Zambello, a superstar among opera directors. She has taken Das Rheingold -- the first in Wagner's four-opera series -- and recast it from a distinctly American viewpoint. The Washington National Opera is set to produce all four of the refashioned works -- in what is being called the American Ring -- over the next few years. Zambello, a New Yorker, now has productions under way in opera houses across the United States, Europe and Australia. Her credits include a production of The Little Prince for television and stage productions of Disney musicals. Coming up, she has production of Show Boat in London. She talks to Robert Siegel about reimagining Wagner's operas and her use of America's rich storytelling tradition and mythic past to involve a contemporary audience. She argues for making opera more accessible to wider groups, including teenagers, and she discusses her work as a storyteller -- whether it's staging Puccini's La Boheme sung in English or Aladdin at Disneyland.